Transfer your domains to Uniregistry. Save time, money, and your sanity. Still paying for domain privacy protection? Renewal fees creeping up each year? Sick of getting upsold around every corner? We built Uniregistry to give our customers total control, honest pricing, and products that are simple to use. No frills, no gimmicks, just a solution that works every step of the way. Whether you have one domain or a thousand, transferring your names to Uniregistry is as easy as flipping a switch. It’s easy to transfer domain names to Uniregistry. Unlock and request authorization codes for your domains at your current provider. 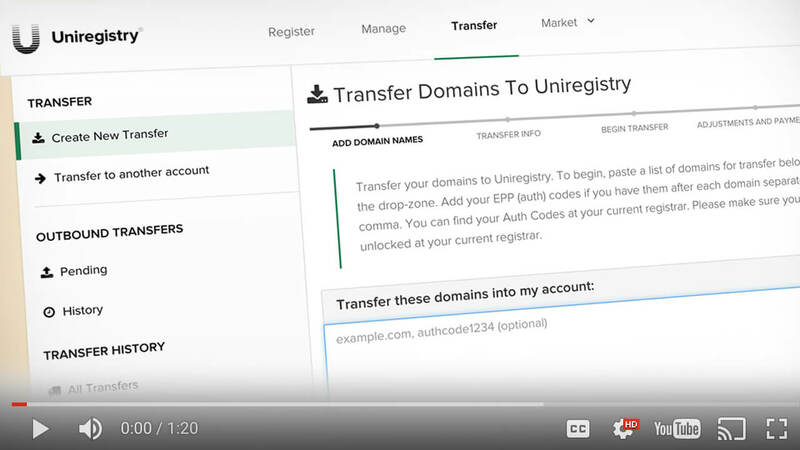 Start the transfer at Uniregistry by clicking Get Started below and pasting in your domains and authorization codes. Follow the steps in our transfer wizard and you’re done. We’ll notify you as soon as your transfer is complete and your domains are safe and sound at Uniregistry. Your names will love you for it. The most common misconception with transferring domain names from one registrar to another is that you need to wait until your expiration date to avoid losing registration time you’ve already paid for. The truth is, when you transfer, we let you keep your original expiration date and we simply add one additional year on top of that. You learn something new every day! Prices you can count on. Imagine that you have access to a safe, affordable, and convenient parking spot for your car. Would you choose to pay more to park in an unsecured and sketchy space? Why do it with your domains? Our business is built on relationships, not greed. Large portfolio holder? Get in touch with the sales team for bulk discounts. Don’t worry, the future is bright. We built Uniregistry with a vision for a better future void of aggressive sales staff, unnecessary upsells, and outrageous prices. Our platform is designed and battle-tested to satisfy the needs of the largest tech companies and domain name investors on the planet. When we talk about innovation, we mean it. Our fully featured mobile apps give you unprecedented control over your domains with a beautifully integrated experience. You can buy, sell, transfer and manage on the go, with ease. Advanced DNS management and domain forwarding. Industry leading two-step security verification to protect your account. Rock-bottom domain registration and renewal pricing. Access to hundreds of new TLDs, some of which are exclusively available through Uniregistry. Exclusive access to the Uniregistry Market and brokerage service to help you buy and sell premium domains. Our brokers lead the industry in service quality. You’ll love working with them. A team that moves rapidly and continuously innovates to fulfil your needs. Our customer support staff is available to help you every step of the way.